Brassias are commonly called spider orchids. Brassia bear flowers with long narrow sepals that give rise to their common name. Brassias are intermediate growing orchids. They like their night temperature between 55F to 65F, day temperatures between 75F to 85F. They can tolerate higher temperatures if there is sufficient air ventilation. Brassia orchids like very bright light with some cool or filtered sun; as bright as possible but avoiding the midday sun. Ideal humidity is 50% - 70%. The roots of the Brassia do not like to remain dry for any length of time. 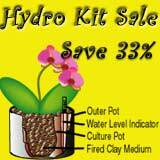 Using the hydroculture system will aid in knowing when to water and how much. This system will also help provide the additional humidity that these lovely orchids need. Mix the nutrient solution as per packet directions. You may store the nutrient in a gallon plastic bottle to be used whenever it is time to water your plants. It is best to keep it at room temperature and out of direct sunlight. Pour the nutrient slowly into the clay pebbles next to the water level indicator. Water until the indicator reads about half way between the "min" and "opt" level. Always be sure there is no water in the outside pot before water again. About once a month, rinse the foliage and the clay pebbles under warm running tap water to remove any dust and accumulated plant food from the growing medium. It is best to do this early in the day. Return the culture pot to the outer pot and water with the prepared nutrient solution.